Being back in Haiti this past week has been like coming back to my second home. I am feeling more and more comfortable here each visit. I am still missing my dog and missed the 1st Ohio State Football game of the season-but my heart is happy to be back in Haiti. Last week I flew in with a short term team from Indiana. We held a mobile medical clinic in the village of Peredo for 2 days with 2 Haitian doctors and then went up to the remote village of Seguin in the mountain area past Peredo. 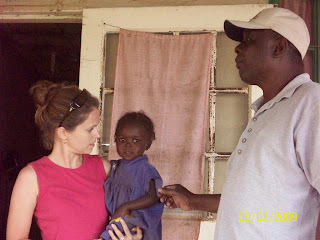 We did some more cleaning of the clinic there and then handed out clothes, shoes and some quilts to the people there. The weather has been nearly or at 100 degrees everyday but Seguin is at such a high altitude that it is cool during the day and actually cold at night. Seems like the wrong thing to say when talking about Haiti but it is actually cold there. I took up some clothes that Churches in Licking County sent like jeans and long sleeve shirts and some long skirts for the women and the team from Indiana brought shoes. 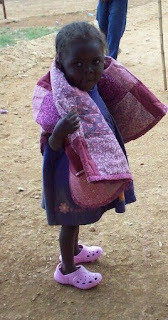 One little girl who walked to the clinic by herself named Jenny (pictured above) received a pair of shoes and a warm quilt to sleep in. She was so cute! I couldn't help but scoop her up in my arms and then couldn't hardly put her down. When I asked her where her mom was the only reply I got was, "Li pa la." (She's not here.) We saw her in the distance walking back home with her new pink Croc shoes and new pink quilt bobbing around her neck. Thank you for the support of this mission. 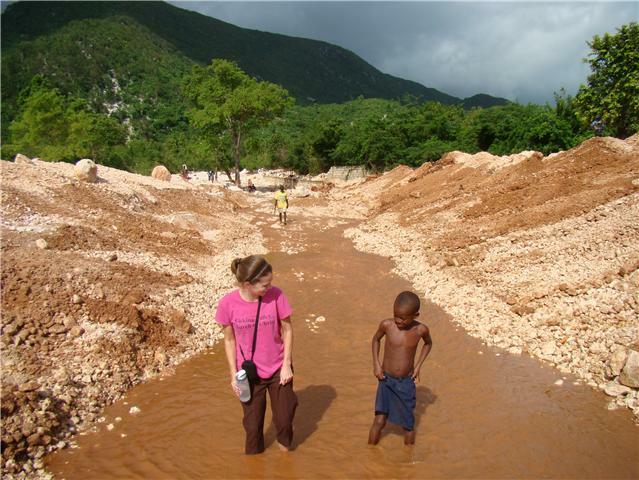 There is no way we could fill all the needs of the people of Haiti but I know we made a difference in Jenny's life. Thanks for the update Ginny. Take care and God Bless. Ginny, what wonderful things the LORD is allowing to happen through your obedience to Him. I love reading your blog and Jenny was SO cute!